This dairy free Cherry Almond Breakfast Shake is so easy to make and is a great healthy option for breakfast! 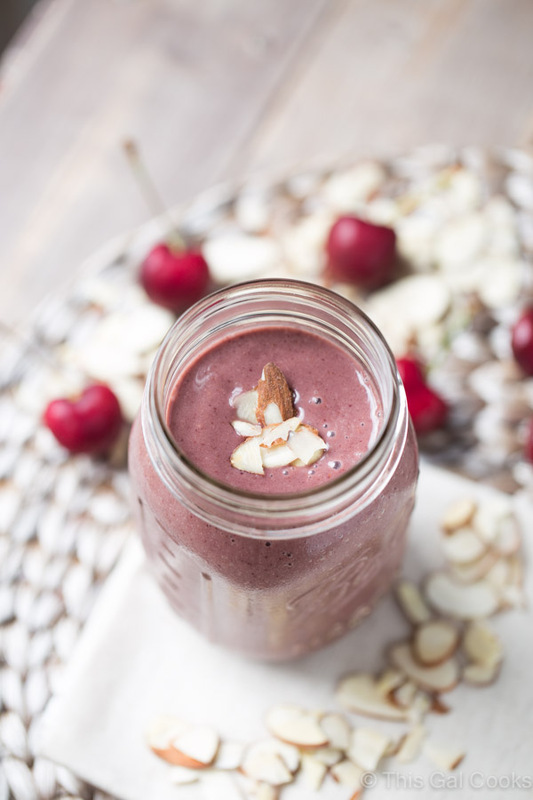 If you love cherries and almonds, this breakfast shake is for you! I feel like I’ve neglected this blog all weekend. And I probably did. But that’s ok. I had a good reason to – my mom was in town for a long weekend visit! I work at a bank so I had yesterday off. My mom doesn’t work at a bank so she didn’t have yesterday off. But I told her to take a vacation day so she ended up having yesterday off. She came to visit on Saturday and stayed until yesterday afternoon. We had a grand time. Ken and I took her out for some craft beers and then some coffee. Well, she didn’t have any craft beers. We have had her try so many beers and she doesn’t like any of them. She makes the funniest faces after trying them. I told her and Ken that I needed to start a blog called My Mom’s Face When She Tries Craft Beer. Because it would be funny and we all need a little funny in our lives, right? Anyways, after craft beer, coffee and a random car show, we went out to dinner at a place we probably won’t go to again. Good food. Not so good atmosphere – unless extremely drunk people at 6pm is your thing. To make up for it, we went to my most favorite restaurant ever on Sunday night. My mom loves it too – we’ve taken her there a couple of times in the past. And I know I’ve mentioned it to you before; it’s called District Table and Bar. It’s in Stuart, FL. If you’re ever in Stuart, FL, you HAVE to go to this place. We started of with an order of Grouper Cheek Fritters. For the main course, Ken and my mom both got Lamb Meatballs, with mom getting quinoa salad to go with hers and Ken getting lumpia to go with his. I went all out and ordered swordfish that came with king crab, basil polenta, roasted tomato and farm beans. SO FREAKING AMAZING! So let’s talk cherry and almonds and breakfast shakes. I like cherries. I like almonds. And I like breakfast shakes and smoothies. This shake was actually intended to be a smoothie but after making it, it was more like a shake. So I didn’t want to call it a smoothie. I used frozen dark sweet cherries, almond milk and almond butter in it. Hence the name Cherry Almond Breakfast Shake. 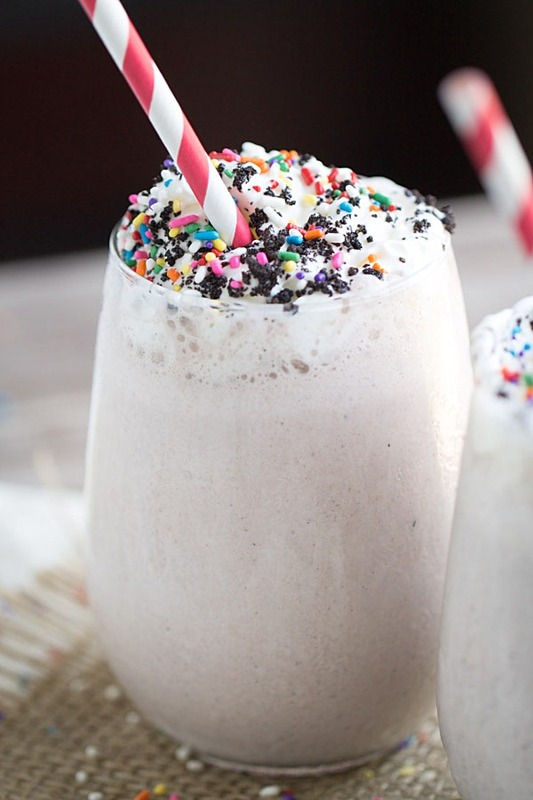 This shake is super easy to make. Seriously, I was sipping on it 10 minutes after I pulled the ingredients out of my pantry and freezer. I made the shake with frozen dark sweet cherries, unsweetened vanilla almond milk, almond butter, a banana and a little maple syrup for sweetness. The almond butter definitely boosts the almond flavor. If you’re looking for a subtle hint of almond, reduce the amount to almond butter used to make your shake. 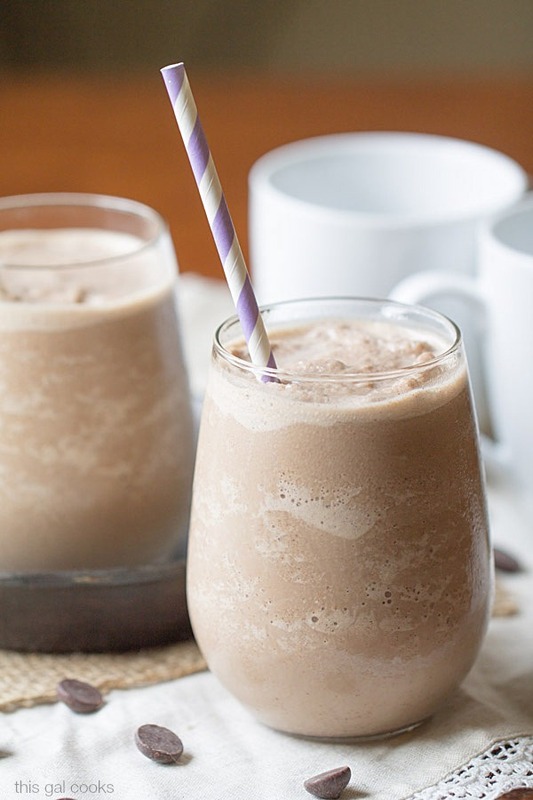 Enjoy the recipe and happy breakfast shake drinking! This dairy free Cherry Almond Breakfast Shake is so easy to make and is a great healthy option for breakfast! Place all of the ingredients in your blender. Pulsate a few times to break everything up and then blend until smooth. I used a Ninja Ultima Blender and blended on speed 7 until the shake was nice and smooth. Pour into two 12 oz glasses and serve. Berry Pie Smoothie | Averie Cooks. 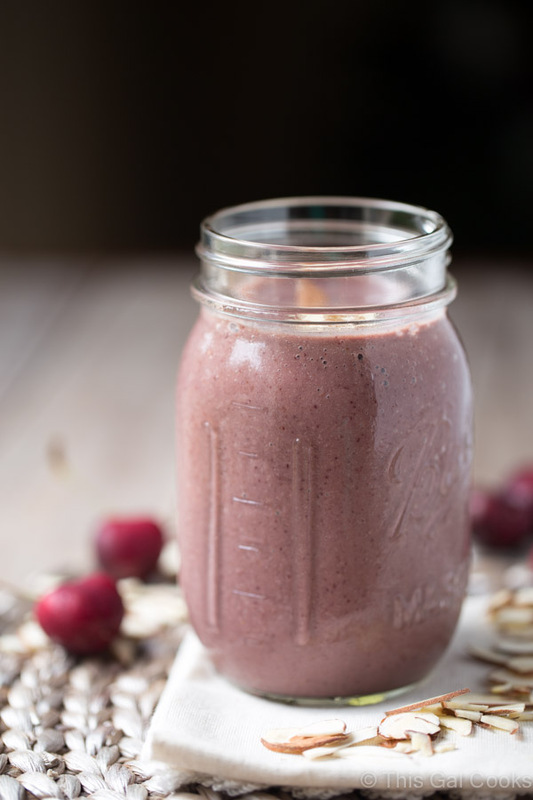 Cranberry Pomegranate Smoothie | Cooking Classy. Blueberry Peaches and Cream Green Smoothie | Cupcakes and Kale Chips. 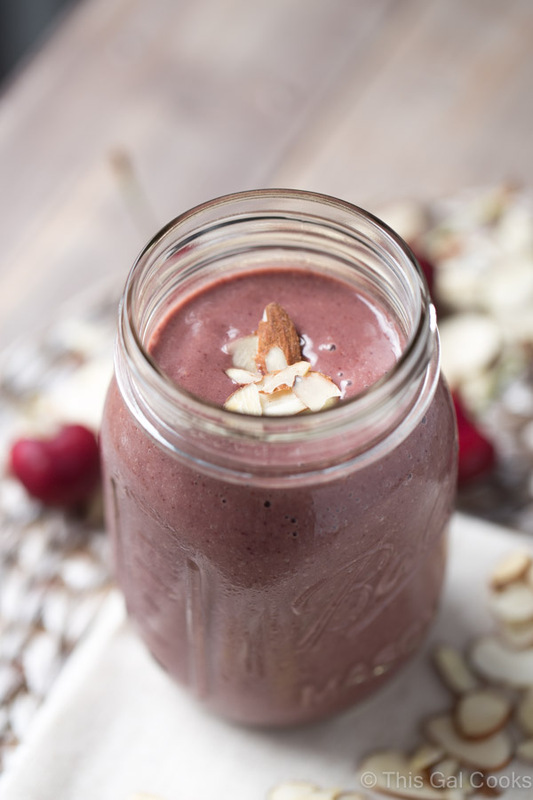 Yum, I could use one of these shakes for breakfast right now :) I love the combination of almond and cherry flavor! THIS SHAKE! It is SO pretty! I really need more shakes in my life, I get so sidetracked with oatmeal. Pinned! Aww thanks, Taylor! OMG, I’ve totally been sidetracked by oatmeal, too! Dang girl! This shake is calling my name. I adore cherries and absolutely can’t get enough of almond butter so I will be making this ASAP! Hope you enjoy the shake, Meg! Mommies are super important so neglecting your blog is a good thing. Also this smoothie is fantastic. I’m in love with the flavors! Thanks Jocelyn! I’m totally in love with the flavors, too! I think I just found tomorrow’s breakfast! YUM!!! I just got a new blender and have been going crazy with the green smoothies lately. Pinning this to switch up my routine! Looks so delish! True story – I have not made any green smoothies. EVER! I really should give them a try, though. Hope you enjoy this one if you give it a try, Graham! Sounds like you had a great visit with your mom, Julie! I was also off work yesterday, so I definitely loved having a three day weekend, too! This breakfast shake looks fantastic! I love the combination of cherries and almonds. Definitely a breakfast I would look forward to having in the mornings! Pinned! Three day weekends are the best, aren’t they, Gayle! SO glad I was able to spend this one with my mom. :) Thanks for stopping by and for the compliments and pin, too! Oooh, now I want to go to that restaurant, even though I am probably never going to get the chance to go … boo hoo! I’m not a shake or smoothie girl really, but that one sounds gooood! Cherries and almond are a match made in heaven, and I just love the colour! Sounds like you had a lot of fun with your mom. I always end up neglecting the blog when someone comes to visit. Sometimes you just have to. This smoothie looks so delicious! I bought a container of cherries a few days ago and no one’s touched them – I should definitely make this! You’re right about that – it’s good to neglect the blog sometimes, especially when people come to visit! You should totally try this smoothie, Amanda. I think you will like it! This looks really good! I’m up to my ears in fresh cherries right now so this is perfect! I’m glad that you had a great weekend with your Mom. Sometimes it is good to just forget about the blog for a few days. I’m glad that you shared this smoothie with us because it looks amazing! You’re right, Ashley – it is good to stay away from the blog for a few days. I’m going to *try* to take a total vacation from things when we go to Asheville in April but I know I will do a few things. I think I will refrain from posting, though. :) Thanks so much for stopping by. So happy you like the shake recipe! Ya know, I didn’t even think that this was a 5 ingredient recipe! I totally need to use that to market it. ;) Glad you like the shake! I’m such a fan of cherries and almonds – you’re right – they are perfect together! Glad you like the recipe, Medha! So glad you had a nice weekend with your mom :) This smoothie looks amazing! Love the pretty color and the cherry almond combo sounds perfect! This looks so good – I can’t believe it’s healthy! Cannot wait to try this – pinned and have a great weekend!